One of the many concepts shaping our view of self, health, leaders, leadership, and organizations is mindfulness. The purpose of this article is to first provide a quick summary of the concept of mindfulness and its transition from the clinical therapy arena into the leadership and popular press. 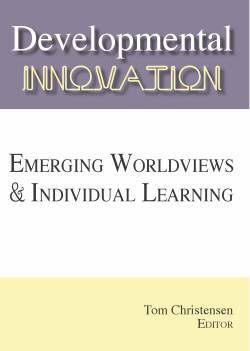 Second, I provide a brief overview of my doctoral findings—the processes by which mindful leaders engage others in change. Finally, I begin to formulate and categorize the major practice-based challenges we face as we help organizations and their leaders utilize more mindful approaches to work. Over the past several decades, mindfulness has migrated from a purely spiritual tradition related to Buddhism, Taoism, or Zen to a common practice that spans a number of domains. Today, mindfulness meditation is a recognized clinical practice. Meditation retreats and clinics are on the rise. Recently, a number of books have been written on everything from mindful eating, parenting, and leadership, just to name a few. Mindfulness is a state of being based on deep awareness of the present moment and what is going on within and around one (Nhat Hanh, 1976) that is characterized by openness, curiosity, and acceptance (Bishop et al., 2004). Mindfulness clears the mind of clutter by stopping habitual sensori-cognitive reactions or associative thoughts and enables one to view life as process rather than object. 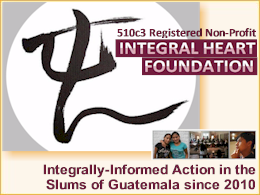 This provides for right action (a Buddhist concept that describes moral conduct and use of the body for deeds that do not harm) as well as deep insight and wisdom. Since 1982, mindfulness has been making its mark in the clinical psychology arena following Kabat-Zinn’s groundbreaking work. By combining mindful practices with clinical therapy processes, Kabat-Zinn crafted a Mindfulness-Based Stress Reduction process that helps relieve stress or emotional and psychological pain. Several other therapeutic processes use similar techniques; examples include Mindfulness-Based Cognitive Therapy, Dialectical Behavior Therapy, Relational Frame Theory, and Acceptance and Commitment Therapy. 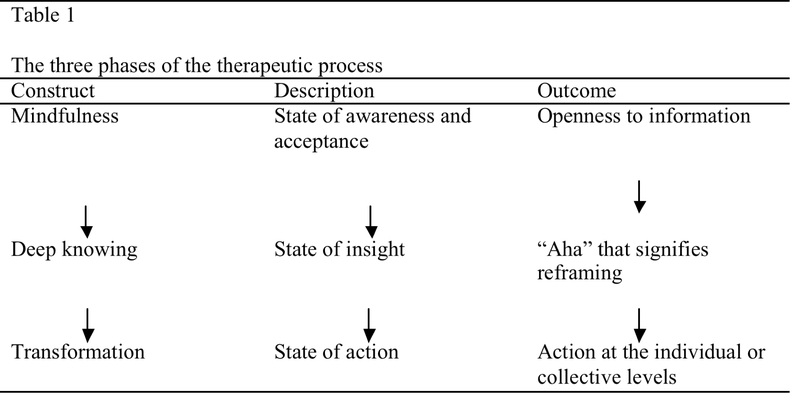 At the heart of the therapeutic process is a three-phase process for change that is illustrated in Table 1 below. Those three phases have been described by a number of therapists and provide an overview of a general process whereby mindfulness serves as a source for insight and consequently for change. There are many benefits to mindfulness: It promotes well being, provides for emotional insight, and enables psychological and emotional flexibility. Mindful awareness is often mentioned as a component of transpersonal knowing. It is seen to be the key to true connection and the dissolution of self-object dualism. Transformative learning theorists, too, describe a state from which transformation is born. According to McWhinney and Markos, that state is attained when one withdraws from the world to a luminal place from which new insights and frames of reference emerge. Mindfulness creates the “aha” space from which we are able to see the world and ourselves anew. Mindfulness provides an entry point to deep and lasting change. But how? And can it happen in a collective? For decades, I have been intrigued by a number of successful leaders with whom I’ve consulted with who don’t appear to fit the charismatic frame. These leaders have faced extraordinary market challenges, repositioned their organizations, and aligned and inspired their staffs in the creation of new and radically different futures. One took a failing magazine from a plummeting loss nearing one million dollars in a single year to the best-selling magazine in its market niche within two years. Another stepped into a position that had a long-history of non-success. The federal agency within which he worked was regular fodder for front-page headlines about bureaucratic incompetence and government waste. He brought that large government agency into the computer age by successfully implementing a massive technology enhancement project that served to modernize the agency’s core business processes. What makes those examples so intriguing is not the challenges the leaders faced, nor the speed with which they created phenomenal results (although that was impressive). What struck me was their style or approach. According to Jacobsen and House, the circumstances in which these leaders found themselves appeared ideal for charismatic leadership—times of uncertainty with great stakes and even survival at hand. Yet these leaders didn’t fit that prototypical mold. They weren’t the eloquent passionate pitchers of new and different futures that we read about in the popular business press. Yet, they engaged their organizations in the creation of compelling new futures. If charisma was not the modus operandi for these leaders, what was? I would describe these leaders as quiet, reflective and intentional. They looked deep inside to question the nature of self and of life. I have come to call them mindful. 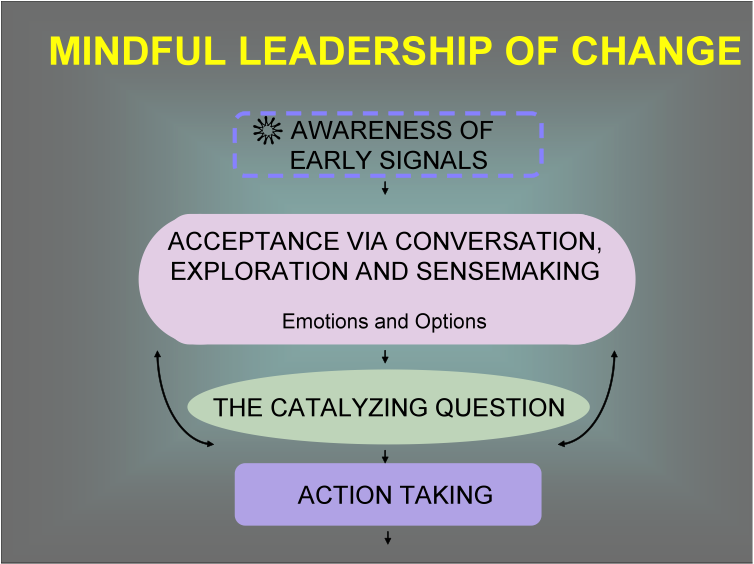 I recently had the opportunity to explore the means by which five different mindful leaders approached organizational change. I conducted a total of 23 interviews and used grounded theory to construct a preliminary model for the mindful leadership of change. A visual depiction of that process can be found below. It is followed by a brief description. The process above provides a high-level overview of four phases. Before describing the phases, it is important to talk about context since the process is context-sensitive. The leader creates that context by providing a container, a safe space, which allows for exploration of the emergent. This space is historically constructed and is built as the leader personally connects to others. That connection is grounded in deep caring and an authentic commitment to people that builds trust. It includes a sensitivity and understanding of people’s (leader’s included) gifts, foibles, and struggles. As a result, there is a deep personalization of relationships. The space is one where all have a voice and bring something of value. It allows people to both dream and vent. It is one where all have a voice, are able to speak freely, and dissent passionately should they choose to do so. It is created and sustained by the leader’s belief in the emergent and in the conversation as a genesis for potential. The process starts with the awareness of an opportunity or the potential for change. 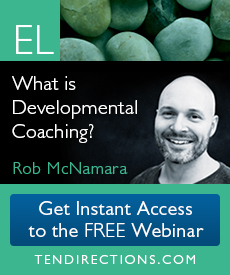 It generally begins early when signals are small and ideas and concepts are not well formed. In other words, the process starts before things are figured out, determination to do something occurs, and at times before concepts can be easily languaged. In other words, conversations about what’s out there, what might be impacting the business, and what could be on the future agenda, are common. Those conversations are started when little is actually known and create the impetus for group exploration of the emergent. From there, lots of conversations occur. As noted earlier, the leaders are cited with the capacity to create a conversational space where all are welcome, all views are valued, and people have the ability to dream, vent and cognitively explore. At its simplest, the awareness phase is described as a thoughtful one that allows for idea generation. It is a process that enables concepts to take shape, feedback to be born, and provides the group the opportunity to listen to what wants to emerge. Acceptance entails two things—emotions and cognitive concepts. The acceptance of both is a concurrent process or parallel process (although the techniques associated with each are described separately below). The leaders in the study were described as incredibly open to emotions and venting. None of the leaders or others with whom I spoke used the word “resistance” to describe what people went through when faced with change. Instead, they spoke of the leader’s capacity to hear people regardless of emotion, eloquence, or awkwardness. The leaders were described as having an inherent reverence for meeting people where they were despite the ways in which others vocalize their emotions. Aside from simply hearing emotions, these leaders were adept facilitators who were able to help people recognize their emotions, identify the source of their emotions (i.e., to be with them), and finally, to let them go. They were profound questioners who made it safe for people to look inside, spend time in reflection, and come to a new place. The processes used for enabling others to explore emotions can be described as follows. Surface: Ask or simply enable emotions to be voiced. Accept: Listen and accept without being overcome by emotions (self or other), or otherwise be driven by anything other than the needs of the other in the moment. Allow: Enable emotions to emerge, be made explicit, and be validated as real, true and okay—through questions that promote exploration and examination. Release: Help the other let go. Sometimes the three steps above are all that needed to enable people to vent and release. At times it takes more. The process is a facilitative one that brings people face-to-face with their emotions and asks them to let them go. The leaders whom I studied used different levels of inquiry. Several used a simple task-based or problem solving process, while others used deeper behavior-impact kind or intrapersonal types of questions. The focus during this stage is the building of early understanding. The leader’s natural curiosity provides a foundation from which emergent needs and opportunities are often born. They bring new concepts, ideas, and emergent constructs to the fore. By engaging people early and encouraging dialog, they build not only early understanding but also facilitate early involvement. The broad process used by these leaders to enable a group to explore options is described below. Plant seeds. Provide others with questions, data, research, and/or articles related to potentially new and/or different futures. Make exploration safe. Spark conversation, dialog, and make it safe for people to explore new ideas, concepts, and possibilities, i.e. to give them a cognitive try (to test them out in conversation). Ask open-ended questions about the data or information at hand, what it means, what options it might open, and what potential problems might arise. Those questions provide people with a conversational space to do cognitive testing and to understand broad context and implications. As a result, there is a subtle opening of awareness. Take time. Provide the space for the group to explore different perspectives and to integrate what they mean. Create ongoing forums, safe listening spaces, and ongoing conversations that enable people to hear each other and over time come to a shared identity or a shared picture of what the change could look like. Identify what’s needed. Identify what’s needed to move forward. Forward movement is not defined as moving toward an end result, a plan, or a vision. It’s more a focus on what’s needed right now. What’s needed right now may entail resources, additional information, or the removal of barriers, simply to help the group get to the next level of exploration. The acceptance phase is a subtle one that moves people forward. It utilizes conversation to enable emotional reactions and ego needs to be explored and let go. It is also through conversation that understanding emerges and collective consciousness is built. There are a number of potent outcomes from the exploration phase. Collective understanding is enhanced and collective consciousness is built as people become aware of the breadth and depth of what was once unknown. 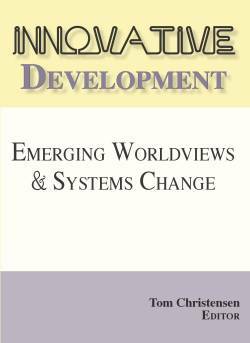 Both leader and others report growing and learning in the process along with an enhanced understanding of context, opportunity and challenges. A shared vision emerges. As a result of dialog, a picture emerges that includes everybody’s perspective. A core group (a critical mass) of people is aligned, engaged, and have an ownership stake in what might happen next. Voluntary association and power are the outcomes. There is an instrumentality created as individuals come to understand how they serve a larger purpose and not just their individual needs or purpose. Once the collective is of “shared mind,” movement is possible. It is sparked by the catalyzing question. The next phase in the change process is a focusing question. The question is action-focused and directional rather than vision or purpose focused. It’s an open question that sparks movement and makes that movement really immediate for people. A common example is, “What do you think we should do about…?” Leaders and others consistently reported surprise at the level of movement sparked by such a simple question. Action taking has a short horizon and is informed by emergent issues. Movement, then, is an iterative process driven by dialogic emotional and cognitive sense making. The final phase involves movement—a movement that is focused on the present and what is emerging rather than a longer-term plan or strategy. It involves three phases—a focus on baby steps, an awareness of tensions, and the need for on-going conversations. Movement proceeds via small self-directed steps taken at the local level. Local experimentation creates movement as people relax into or experience their way into the change rather having to be convinced to do or try something. Without a grand plan, leaders do not rely on the typical means for ensuring progress–formal project update or project management meetings to measure and ensure progress. Instead they informally support the process by checking in. These how’s it going dialogs provide the space for new ideas, concepts, and needs to inform and/or be integrated into the process. Those conversations also enable tensions and/or discord to surface. Those tensions create the need for ongoing conversation and often result in shifts in plans, the need to start anew, or to enact the “do-over” as conditions require. They create the need for dialogic sense making—a return to the inquiry processes explained earlier. Tension-related conversations may return the group to a previous place in the process. Regardless of whether the group returns to a previous phase in the process or simply moves ahead better informed, there is informed movement. In other words, the outcomes of these discussions drive future actions. Movement is an iterative process born in conversation. Makes the implicit explicit while increasing mindfulness of, and lessening attachments to, things, thoughts, emotions, and other objects. Engages the collective in understanding where they are and where they might be. Forges understanding and movement out of many voices. Uses a holistic process that enables others to determine how they fit and what they owe the world based on what is emerging. The process is the means by which theory about what is emerging informs action—and mindful action creates an awareness that informs ongoing sense making and theory. It is the means by which theory informs practice and practice informs theory. It is a process that was studied from a leader perspective (i.e., what does the formal leader do to enable change to occur). It is one that needs to be studied from another, group, or distributed leadership perspective to understand the role that others play in the process as well. While I personally find the work above to be compelling (perhaps because I created it), I find my thinking about the future and the need to recreate our work with organizations and their leaders even more compelling. While the world scurries to get on the mindful bandwagon, those who are truly mindful recognize the need to slow down in order to move forward. It is a place where I frequently find myself. When I do, I am struck by the number of organizational and leadership strategies so firmly situated in a western mindset. I have adopted a mindful frame that has me unsettled in terms of the depth and breadth of work that needs to be done! Others, many of whom have contributed to this journal, can probably cite similar concerns. Looking at the field of organization and leadership development, with an appreciative frame or a dialogic frame or the frame of your choosing would probably create a similar list. I have the following items on my personal agenda. I am hopeful that I and others will make considerable impact in these areas as we work to enable organizations that their leaders operate more effectively in our changing world. How do we define leaders? I remember being struck by the humble nature of the leaders that I interviewed. That humility when extended to the change process opens worlds and possibilities. Mindful leaders approach groups with a challenge in hand and an open heart and mind. As a consequence, the space the group works in is generative as emergent issues, ideas and concepts are brought to the surface and explored rather the degenerative as rational problem solving picks apart that which is before the group. There is great leadership power in humility for it opens up unlimited potential. How does our work need to change to support the identification of these leaders? It was not all that long ago that we desired our leaders to be planners and project, performance, and process owners extraordinaire. How strong is that prototype in the typical organization? Increasingly, we recognize the need for leaders who are sense-makers, facilitators, and communication starters. A continually and radically changing world requires leaders who create groups and entities capable of flexing in the moment and using judgment to compass a path forward that results in intended outcomes. What are the means by which we can help organizations identify those leaders?Look back on the entire competency craze. Imagine attempting to pinpoint with behavioral-statement accuracy the qualities of great leaders. Many organizations and practitioners see those competencies to stand the test of time (if not for perpetuity, at least for a good number of years). Yet, in a world in continual flux—what makes for greatness today, may not make for greatness tomorrow. Cookie cutter leaders modeling codified competencies and behavioral sets are grounded in an extremely rationale worldview based on the premise that we can understand, define, control, predict, and measure an unchanging world. We need to shift from measuring defined competency sets with one- to two-digit accuracy to helping leaders understand the capacities required to be mindful, open, flexible, and selfless, while being driven by a constancy of purpose. How does what we teach leaders need to change? Imagine a process as simple as feedback. The actual exchange is presented to many as follows: Tell them what you saw or heard, tell them your reaction, and ask and/or suggest that the other do something differently. Should the other choose to verbalize how his/her view may be different than your own, consider him/her to be defensive? The entire process devalues the others, negates his/her worldview, and drives (rather than dissolves) the subject-object relationship. How does organizational planning and strategy need to shift? Consider how the average organization defines movement and how it plans for that movement to happen. The standard, every-couple-of-years strategic planning process, as an example, is woefully lacking. It is model based on the ability of a chosen few to predict and crystallize the potency of an uncertain and unknown future into a few big challenges or opportunities, plan for them, and allocate resources over a multi-year agenda. Research has shown that once we make a plan, we like to stick with it. The process leaves little room for change and adjustment as the organization moves forward. The plan once developed is driven to conclusion (or death) and the process begins again. What would our models be if we enabled organizations to understand and adopt practices based on the premise that movement is a consequence of deliberation? Large group planning processes and organizational practices such as Holacracy™ provide a solid foundation. How widely known and used are they? Imagine the potential if organizations operated in ways that enabled new or alternative thoughts to be brought to the fore, so that the consciousness of the collective might expand, and eventually the collective mind might shift, so that eventually that collective as a whole was in a different and more enriched place. In a world so quickly changing and with challenges that continue to be more and more daunting, there is a need to enable organizations to use more mindful and dialogic change processes at the organizational, group, and individual levels. In short, we need to focus on enabling the organizations for which we work to slow down and pause to understand that which is emerging. A new world awaits, and a new world is continually being born. 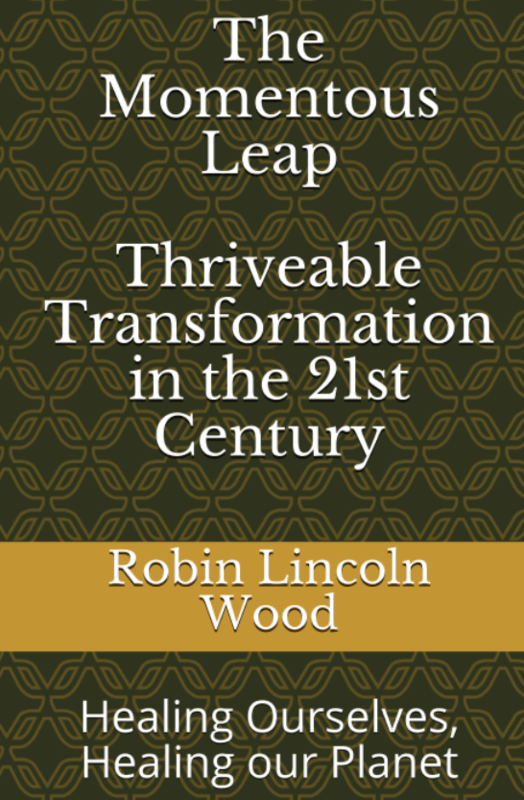 We are working in extraordinary times, as previous concepts and constructs are falling away. We have the opportunity to enable others to operate more effectively in a world that is less malleable than once thought, less stable than once believed, and shaped by people and forces that we are just beginning to unravel and understand. As a consequence, our view of organizations and how they operate, leaders (who they are and what they do), and ourselves (and our role in helping them) is shifting as well. As practitioners, theorists, and researchers much work lies before us. I am humbled, and proud, to be among the many working to help others explore this new world. Bishop, S. R., Lau, M., Shapiro, S., Carlson, L., Anderson, N. D., Carmody, J., et al. (2004). Mindfulness: A proposed operational definition. Clinical Psychology: Science and Practice, 11(3), 230-241. Gunaratana, B. H. (2002). Mindfulness in plain English. Boston: Wisdom. Kabat-Zinn, J. (1982). An out-patient program in behavioral medicine for chronic pain patients based on the practice of mindfulness meditation: Theoretical considerations and preliminary results. General Hospital Psychiatry, 4(1), 33-47. Kabat-Zinn, J. (1995). Wherever you go there you are: Mindfulness meditation in everyday life. New York: Hyperion. Kabat-Zinn, J. (2003). Mindfulness-based interventions in context: Past, present and future. Clinical Psychology: Science and Practice, 10(2), 144-156. Kabat-Zinn, J. (2005a). Coming to our senses: Healing ourselves and the world through mindfulness. New York: Hyperion. Kabat-Zinn, J. (2005b). Full catastrophe living: Using the wisdom of your body and mind to face stress, pain, and illness. New York: Bantam Dell. McWhinney, W., & Markos, L. (2003). Transformative education: Across the threshold. Journal of Transformative Education, 1, 16-37. Nhat Hanh, T. (1976). The miracle of mindfulness: An introduction to the practice of meditation (M. Ho, Trans.). Boston: Beacon Press. Great article, Rosaria. You have made the concept of mindful leadership tangible AND actionable. Rosaria, this is a great article that has given me ideas and a direction to work towards. As an HR manager I am constantly looking for innovative ways to connect, engage, and develop my organization. This type of leadership thinking is the powerful, forward thinking answer I have been searching for. I would love to learn more about the changes you have witnessed from the mindful leaders you have worked with. As a retired professor and long time consultant, it is refreshing to read about a new way to define leadership and leadership development. 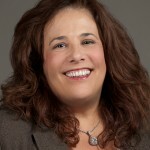 As a long time leader of public agencies on both the state and city levels, I think Rosaria’s article outlines a smart and well researched approach to leadership and organizational change. There is widsom and knowledge throughout big public sector organizations. The trick is finding it and putting it into practice. The ‘mindful’ approach outlined clearly and effectively in her article is a wonderful tool for any public administor who wants support and encourage leadership within their organizations.